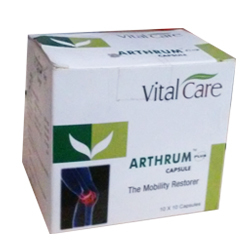 Arthrum Capsule Cures Muscular Pain, Low Back Pain, Swelling, Stiffness, Joint Pain & Other Painful Condition. Muscular Pain, Low Back Pain, Swelling, Stiffness, Joint Pain and other painful condition. Nyctanthes arbortristis (Parijataka) Ext. -	100 mg.
Vitex negundo (Nirgundi) Ext. - 100 mg.
Pluchea Lanceolata (Rasna) Ext. -	100 mg.
Boswellia serrata (Shallaki) Ext. -	70 mg.
Withania somnifera (Ashwagandha) Ext. -	50 mg.
Colchicum luteum (Surinjana) -	50 mg.